The macaronis “traveled in groups; wear extremely tight, feminine clothing; are extremely egocentric, and basically annoyed everyone else with their flamboyant presence. They rivaled the ladies with their tall wigs and were even known to powder it different colors like blue, pink, purple, etc. The hung out in gentlemen’s clubs such as The Macaroni club and gambled, womanized, sodomized, gossiped, and wasted countless pounds of frivolous things”. 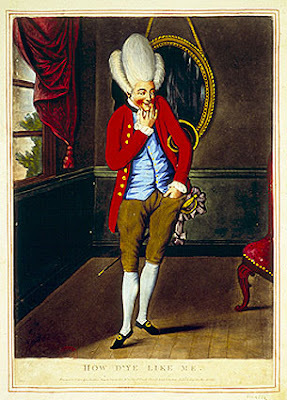 The dandy’s “always wearing something unique but very fashionable, never says anything to make himself seem weak, is always calm and collected, and never appears to falter. The Dandy makes you fall in love with him although he is untouchable and impenetrable to love”.